The domaine was founded in 1894 by Ferdinand Charleux, who owned just a little over one acre of vines. Ferdinand’s son Joseph embarked on an ambitious expansion and when he retired after 30 years of hard work the domaine grew to an impressive 8 hectares of vines. Maurice took over in 1970 and branded the wine; hence the name of the winery: Maurice Charleux. Maurice’s son Vincent started working with his father in 1990 and recently took over from his father when he retired in 2013. The production of the domaine remains miniscule at less than 3,500 cases per year. Yields are relatively low and although they depend on the vintage they are always below the authorized amount for the appellation. 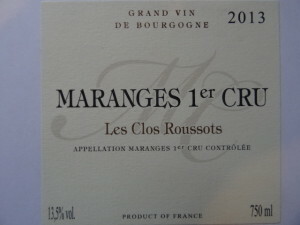 For the 2014 Maranges 1er cru, for example, yields averaged 44 HL/HA (50HL is allowable) As is typical for the Maranges appellation the domaine producers 7 times more red than white. The soils are clay/limestone, with percentages varying between the vineyards; the Maranges Premier Cru Les Clos Roussots has a high percentage of clay, while La Fussière has more limestone. Certain parcels are worked with a plow while others, especially when there is danger of erosion, are covered with grass. The Charleux family farms in lutte raisonée, that is sustainably, using copper and sulfur during most of the year while several times of the year they might feel it necessary for the health of their plants to incorporate a synthetic treatment. For the reds, only indigenous yeasts are used. The reds are de-stemmed, a 3-5 day cold soak, and a 15-21 day fermentation period in cement tanks or foudres, with punch downs, pump-overs and delestage. The premier cru wines go into oak casks, approximately 20% new for about 12 months, times vary based on vintage, and then after a light filtration the wines are bottled. 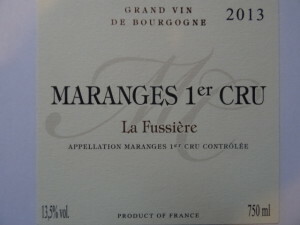 La Fussière is the largest 1er Cru of Maranges, covering an area of almost 35ha. The Domaine owns a 1.5 hectare plot in La Fussière. Soil is clay-limestone but rich in limestone giving lots of bright, crunchy blueberry and red fruit notes, especially sour cherry. The vineyards are South-facing at about 300 meters above sea level. The grapes are harvested by hand and sorted in the vineyard and then again in the winery. Only indigenous yeast is used. The reds are de-stemmed (depending on the vintage a % of stem inclusion) then there is a cold maceration of 3-5 days followed by 2-3 weeks of fermentation done in cement tanks. The wine is aged in oak (20% new) for about 1 year.